In Omaha, a player is dealt four cards face-down and five more cards are opened face-up on the table. The difference of this type of game from Texas Hold'em is that the player must use only two of his four cards to form the strongest hand. He cannot play the board or use one of his cards and four of the board cards. Therefore, forming the hand in Omaha poker means using any two of his cards and any three of the board cards. Just like in Texas Hold'em, there are four stages in this game: pre-flop, flop, turn, river. Similarly, Omaha can be played as a No Limit, Pot Limit or Fixed Limit game, although the Pot Limit variation is the most common one in online poker rooms. 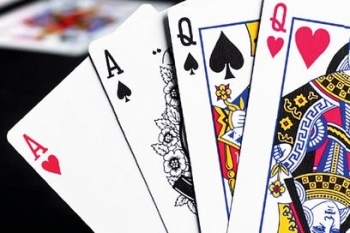 Since every player has nine different cards at his disposal, a typical Omaha game involves a variety of much stronger hands than can be usually seen in a Texas Hold'em round. Straights, flushes and even full houses are very common. Sometimes holding two aces in your hand is not enough. We invite you to read more about winning in Omaha Poker.